27th September each year is celebrated since 1980 as the World Tourism Day under the auspices of United Nations World Tourism Organization (UNWTO). 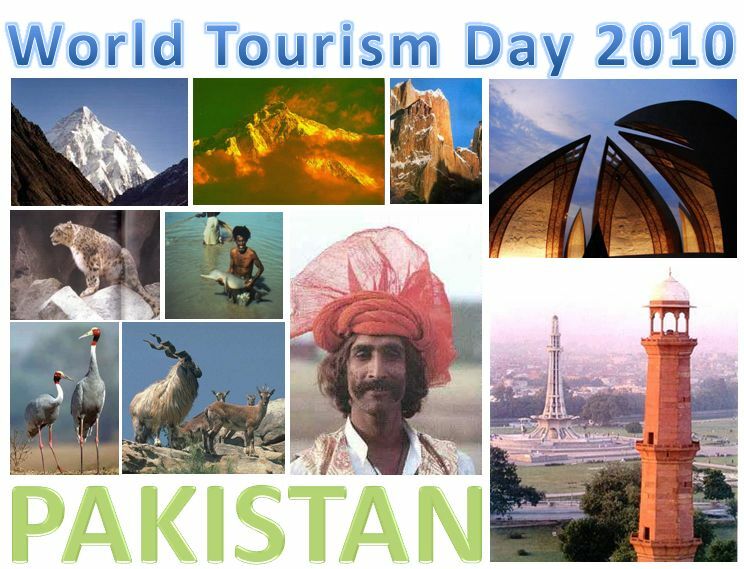 The purpose of this day is to raise awareness on the role of tourism within the international community and to demonstrate how it affects social, cultural, political and economic values worldwide. This year the theme for the day is “Tourism –Celebrating Biodiversity.” Official celebrations will be hosted by China on 27 September, with many other events taking place around the world, including the 30th anniversary celebration of the establishment of the UNWTO. The theme selected for this year would help focus on the world’s cultural wealth and role of the tourism industry in revitalizing local traditions and making them flourish as these cross other cultures. The local customs and traditions are generally reflective in the languages, food, architecture, religion, attire and even the natural environment. Like all other countries, the culture and traditions of Pakistan are unique, attractive and awe inspiring. These are a fine blend of our millennium old cultural heritage stemming from the Mehrgarh Civilization, which as old as 9000-7000 BC, and the following Moenjodaro, Kot diji, Taxila and Gandhara civilizations. With the arrival of Islam in the 7th century and the incursions from the North by the Mongols, Turks, Afghans and the Moguls, Pakistan has become a showcase window of the cumulative effect of all these civilizations, religion and empires. The city of Lahore is rich in its cultural heritage while remains of Mehrgarh (Balochistan), Moenjodaro and Kot Diji (Sind), Taxila and Harrapa (Punjab) and Rehman Dheri and Buddhist remains (Khyber Pakhtunkwa) provide an insight into our rich cultural heritage. The customs and traditions of Pakistan are diverse in nature and each province has its own peculiar traditions that are found in their way of life, food, languages, music, festivals and literature. Pakistan is also a haven of natural wonders and landscapes. From the snow covered pinnacles of the north, that include the K2 (the second highest mountain after Mt Everest) and many other peaks that top in the world listing, lakes with picturesque view. The lush green Deosai Plains are the highest plains in the world. Punjab offers vast green pastures, while Sind and Balochistan have wide tracts of desert and semi desert terrain. Near Ziarat (Balochistan) one finds the second largest Juniper Forest of the world with trees as old as 5000-7000 years. The Arabian Sea that skirts the 1200 kilometres coastline of Pakistan along Balochistan dn Sind provinces is home to still virgin beaches. The mangrove forests in Sind are unique in the world. Pakistan is also home to some of the endangered species like the Snow Leopard, the Marco polo Sheep, Markhor, Hooubara Bustard, the Himalayan Brown Bears and the Blind Indus Dolphins. Besides Pakistan attracts millions of migratory birds from around the world each year in search of warm waters to its countless wetlands and lakes and is an ideal place for the bird watchers. The people of Pakistan are extremely simple, hearty and hospitable. Those who venture out to Pakistan carry back pleasant memories of love and care by their Pakistani hosts. It’s fun to be in Pakistan, despite many misconceptions.